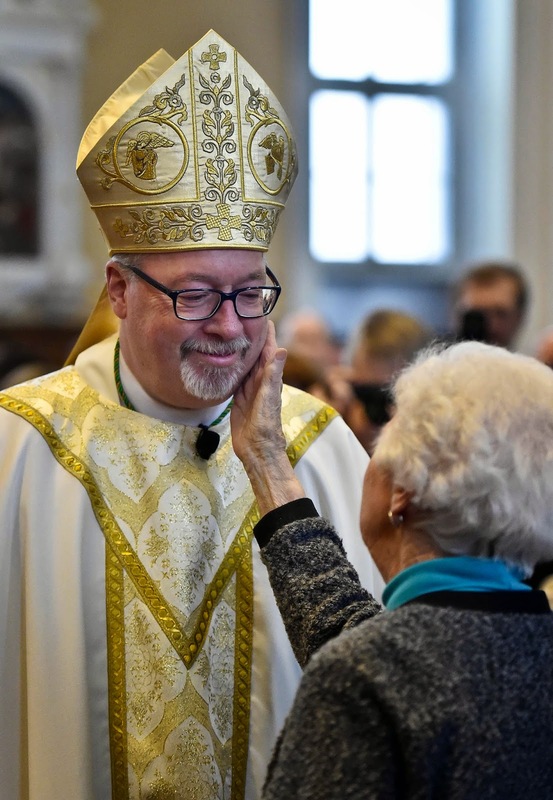 Even for all the tools now easily available, it remains a fact of ecclesial life that most Catholics don't hear from their bishops often, let alone every day. For tens of thousands across the globe, however, the mostly lacking – put bluntly, insufficient – state of things makes it all the more significant that Chris Coyne has become a familiar, easily accessible daily shepherd to a broad flock... and perhaps most effectively of all on several fronts, a prelate who can reliably be heard from without ever asking for money. Come on, you already know it. And yet, despite all that, a well-honed outreach done not out of calculation but simple fun and the sake of the Gospel has had one palpable hitch: being second-fiddle in the diocese – even if the bench has tapped him to lead the USCCB's communications arm – a certain reticence is rightly expected of an auxiliary bishop. With polls routinely citing the Green Mountain State as the US jurisdiction whose residents are least attached to organized religion of any other, the Sant'Anselmo grad made a pointed and significant choice for his Opening Day liturgical texts, opting to use the little-known Mass for the New Evangelization, which the Holy See commissioned for the 2012 Year of Faith. On a personal note, this scribe was supposed to be in Burlington for today's rites, both to be thoroughly entertained and, above all, to support a brother and friend who is one of Whispers' own more than almost anybody else. Alas, the non-blizzard that ended up skirting these parts earlier this week torpedoed the travel plans, a turn of events that – like deflated footballs, Philadelphia clericalism and Starbucks coffee – is clearly of the devil. In that light, even more thanks to Fr Bob Reed and all our friends at CatholicTV for the gift of being able to see the moment in real-time and share it around. All that said, while Mama Rita glowed in the front pew of St Joseph's Co-Cathedral as no less than "Brown Papi" credited her middle boy's return to her intercession with the Pope, below is Coyne's launch-preach back home in his new charge – a text that conspicuously doesn't use the words "New Evangelization," even as its call and Spirit are written all over it. The bells still ring out. Not so numerous and not so often, but they still ring out, their meaning captured in the words of the poet Henry Wadsworth Longfellow, “for bells are the voice of the church; they have tones that touch and search, the hearts of young and old, one sound to all … [The Bells of St. Blas.] Yes, the bells still ring, the bells still search but not many are answering the call. “Come,” the bells say, “Come and worship with us. Come and hear what God has to say. Come to the table and the bath, to the prayers and the Word.” But not many seem to come anymore. Yes, most of churches are still places of worship and communion where folks still gather, but many of those gatherings grow smaller and grayer every year. Folks look out and say, “Where are the young people and the families? Where have our friends and neighbors gone? Why are there so few answering the call of the Church to the life of the Good News?” In response, one could respond with fatalism, with a shrug of defeat, and a kind of long-term communal hospice as door after door after door of our churches close and the Body is finally laid to rest. The gospel we just heard proclaimed points the way. Jesus stood in his home synagogue in the midst of his relatives and neighbors and proclaims himself the one about whom Isaiah prophesized to bring healing to the blind, liberty to prisoners and glad tidings to the poor. His voice rings out as both a challenge and an invitation when he says, “Today this Scripture passage is fulfilled in your hearing.” It is a challenge that is immediately rejected by some as he is forced out of Nazareth by those irate at his words, but it is also an invitation that some hear and accept as they follow him on the way. Jesus does not stay in the synagogue but he goes out. His voice does not simply ring out from a place of worship like a bell stationary in a church steeple, calling people to come to him. He goes out to them. He goes out to spread the Good News of the Kingdom of God and the offer of eternal salvation. No one wants to join a church that lacks joy. When people who leave the Catholic Church to join other churches are asked why did you do so, the number one answer is “They made me feel welcome” followed by “I find the services joyful and uplifting.” If we are going to call people to our churches and they do happen to come in , what are they going to find? People who have the joy of the “good news” in their hearts, people who are welcoming and encouraging, who celebrate the Church’s liturgy with care and commitment or a people who “mourn their religion. Friends, both inside and outside we have to be about the "Good News." Here is our water and our watering place. Here is the bath and the table, the prayer and the words where we are made whole in the love of Christ. Ours is not a place of ruin and lost hope. It is a place of forgiveness, nourishment, and instruction. It is a place of salvation. The bells still ring out from the steeple of this church, even though it is a bit broken and in need of repair. But when the bells ring out from our steeples they are the voice of Christ - He is the bass, midrange and treble that sounds and reverberates in the lives of all whether we know it or not. His bass notes rumble through life moving all to the works of mercy, His midrange voice calls us to be with Him and enjoy his company, His treble notes teach us about a life here as well as above with one He calls Father and teaches us to do the same. They are still bells of invitation to come to Him, yes, but now we hear them as well as an invitation to go out with Him in the power of the Holy Spirit, to spread the Good News of that His Kingdom is at hand at that He, Jesus Christ is Lord and Savior of the world. The “bells are the voice of the church” – the Mystical Body of Christ - “they have tones that touch and search, the hearts of young and old, one sound to all...” One sound to be brought to all.